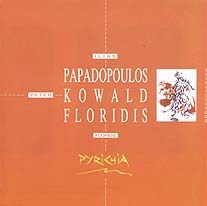 Ilias Papadopoulos, lyre; Floros Floridis, clarinet, flute; Peter Kowald, bass. Recorded at Rock Studio, Thessaloniki, Greece in winter 1991. Cover painting (reproduced above) by Apostolos Kilessopoulos.